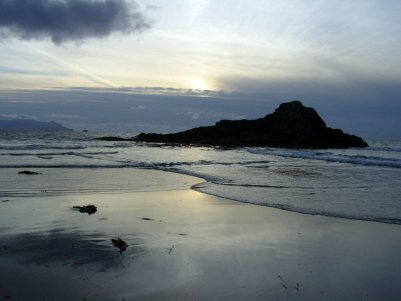 Banna Strand (also known as "The Lonely Banna Strand" - "The Ballad of Roger Casement" is a different song) is a Kerry rebel song about the failed transport of arms into Ireland for use in the Easter Rising. Authorship of the song is unknown. The final verse was written by Derek Warfield of the Wolfe Tones in 1965 when Roger casement`s remains were finally returned to Ireland. A German ship was signalling, way out there in the bay. A motor-car went dashing through the early morning gloom. The German ship was lying there, with rifles in galore. You are our Empire's enemy, and so we bid you stand. The British have us vanquish'd: man for man and gun for gun. We've twenty thousand rifles here, that never will reach land. Where in the Tow'r they laid him, as a traitor to the Crown. 'Twas in an English prison that they led him to his death. 'I'm dying for my country dear,' he said with his last breath. On the lonely Banna Strand. Here is the ballad on U-Tube: The Lonely Banna Strand. “Click Here” for a complete list of songs from County Kerry.